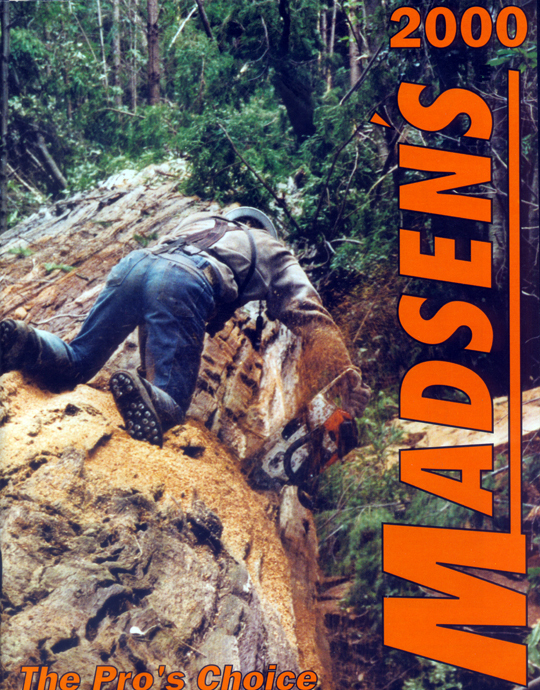 Madsen's Shop & Supply Inc. 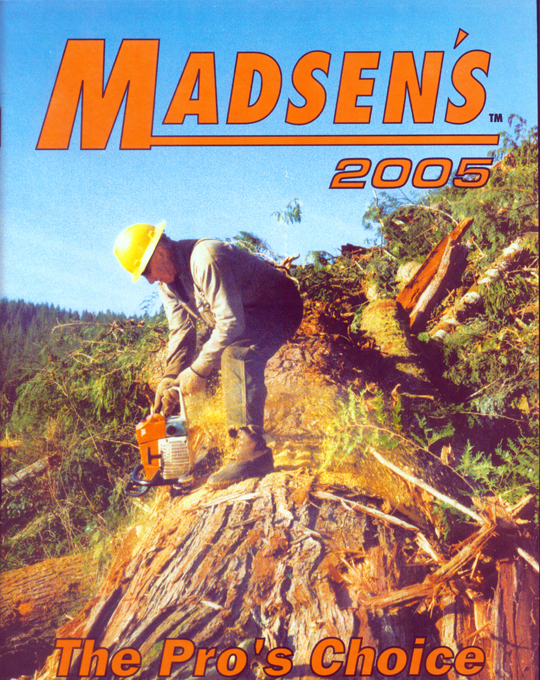 In 1996, Madsen's celebrated fifty years in business. The image below was on the cover of our golden anniversary issue. Pictured above is Joe Barnes, of George Barnes Contract Cutting. The photo was taken by Ralph Madsen on a strip near Chehalis, Washington. In the photo, Joe is running a Stihl 660 fitted with an Oregon 32" bar and Stihl saw chain -- all purchased from Madsen's. For many years, Joe, and his brother George, fell a lot of timber in both Washington and Alaska. The photo on the cover of our 1997 catalog featured Roy Pratt driving a wedge. He is shown working on Port Blakely ground near Oakville, Washington. Also shown is Roy's Husky 371, which was fitted with a 32" Oregon bar and Stihl saw chain. Over the years, all of the Pratt's -- brothers Dave and Walt and Roy's son, Jeff -- were all good customers. The photo was taken by Ralph Madsen with a Nikon FE camera. 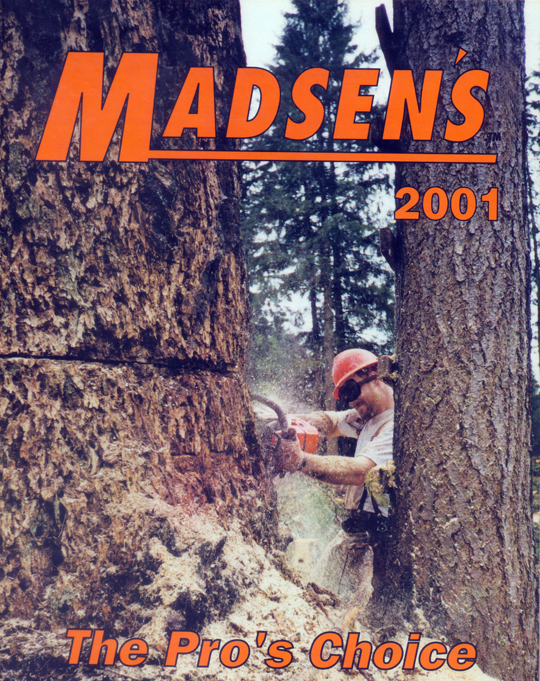 The 1998 cover photo featured Gary Halverson and was taken by his boss, Sam Kilmer of Kiona Creek Cutting. 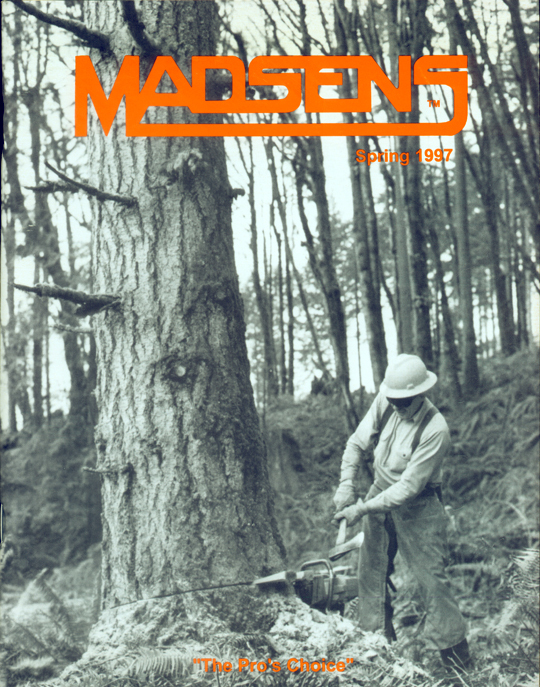 Gary is shown working in a patch of timber owned by Weyerhaeuser located east of Raymond, Washington. He is running a Husqvarna 288 fitted with a 32" Oregon bar & chain. Sam used a Minolta 7000 and Kodak Tri-X film to shoot this photo. 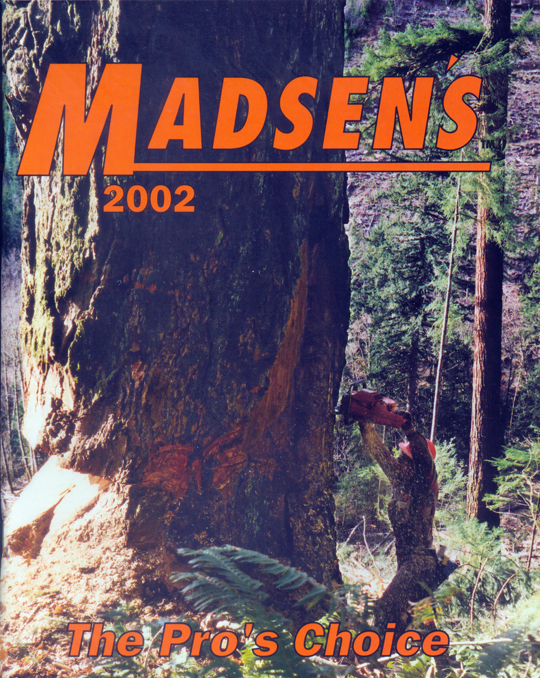 The 1999 catalog cover featured our first color image. In it, Brian Borde of Port Angeles, Washington was featured cutting a nice fir with his Stihl 066. The photo was take by Paul Smithson of Triad, Inc. with his Nikon F2 camera and Kodak 200 Gold film. 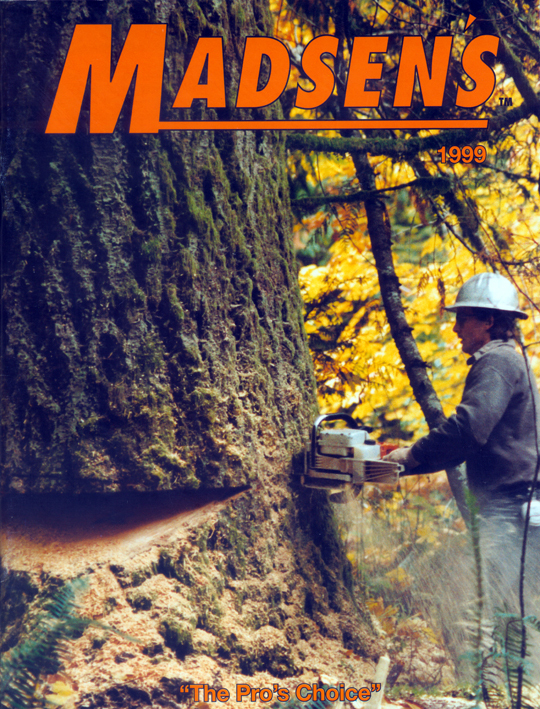 In 2000, Dale Brog is pictured bucking a large redwood with a Stihl 088 fitted with a 60" Cannon bar. The photo was taken by Swede Stolt, crew foreman for Sea Forest, Inc. At the time, Sea Forest was working on a job on Stimson ground near Crescent City, California. The job was being cut for Erickson Air Crane, a helicopter logging operation. Sea Forest's owner, Jerry Lewis, was known for taking on large and difficult jobs. Jerry and his crew developed special equipment and techniques for falling big trees in critical areas. 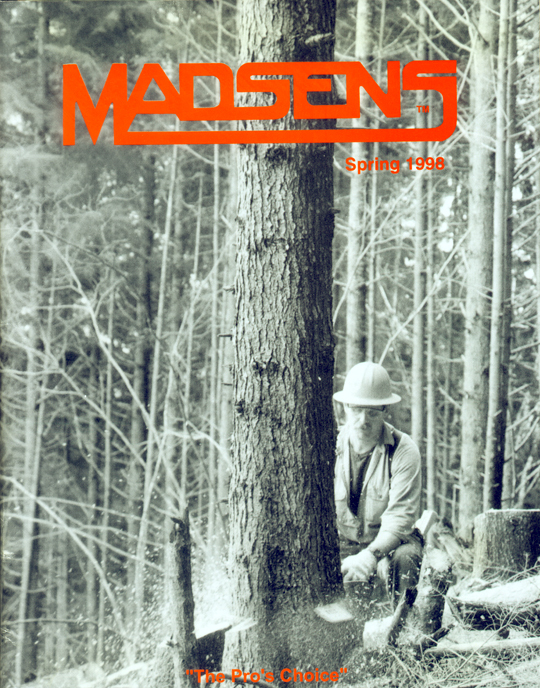 Jerry has since retired, but when he was active, there were many years when he was Madsen's largest customer. Pictured above is Mark Winningham falling a big fir on Port Blakely ground near Forks, Washington. In the photo, he is running a Stihl 066 fitted with a 36" Oregon bar and chain. Mark's crew refer to him as "The Hammer" because of his pedal-to-the-metal approach. Mark is always looking for an edge and believes good tools are the secret to "hammer down" productivity. Mark says, "I expect a 110% - from my crew, my tools, and my suppliers. That's why I deal with Madsen's." This is a photo of Paul Custis falling a seven and a half foot Douglas Fir on Campbell Group ground near Riffe Lake in Washington State. In the photo, he is running a Husqvarna 395 fitted with a 42" Windsor bar and Oregon saw chain. The photo was taken by Ross Hojem, Paul's partner at the time. 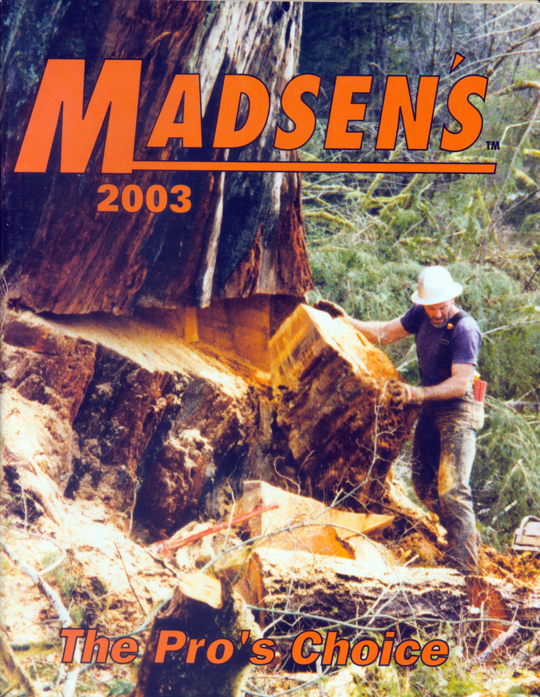 The 2003 cover photo is of Mark Smith chunking out a big undercut on an eight and a half foot Douglas Fir snag near Grays Harbor in Washington State. The cutting was done with a Stihl 066 fitted with a 42" bar and chain. Mark works hard -- and plays hard. On weekends, he pilots an open-wheel "Outlaw" winged sprint car. Mark says dirt track racing and timber falling are similar in many ways. He says, "Both require discipline, plus you must have good equipment. That's why I depend on Madsen's." In 2004, Nick Minahan was featured on our cover. In the photo, he is falling a big fir on a strip near Mint Creek, just outside of LaComb, Oregon. At the time, Nick was working with his dad, Mark, who operated Minahan Cutting. In the photo, Nick is running a Husky 385XP fitted with a 34" Oregon bar and chain. Nick sent this photo to us along with a note that said, " Everything I am outfitted with is from Madsen's." 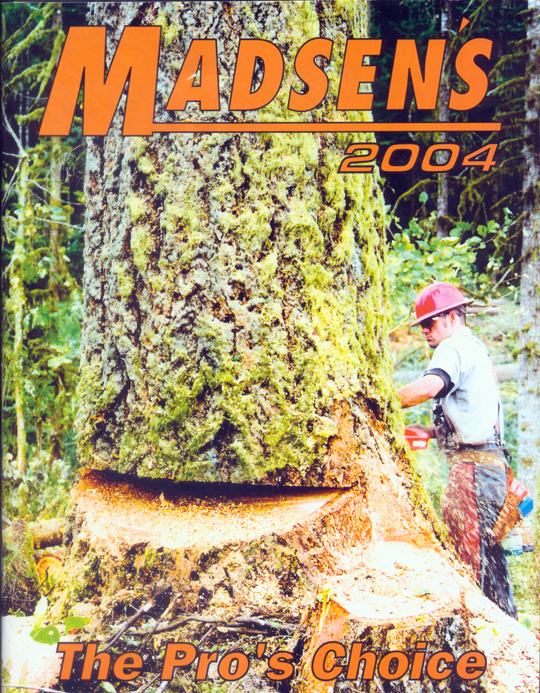 In 2005, our cover photo featured Gary Talley cutting a big cedar on a strip near Quinault, Washington. In the photo, Gary is running a Stihl 660 fitted with a 36" Oregon bar and chain. 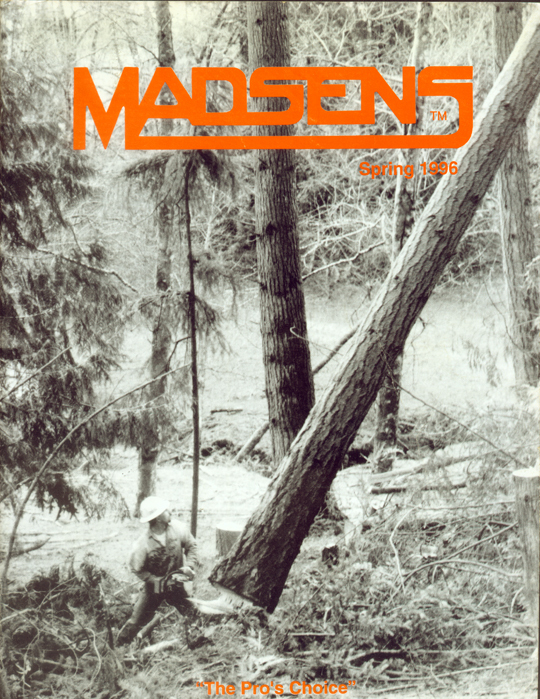 Gary has been a customer at Madsen's for almost forty years. During this time, he and his crews have cut timber all over the Northwest. He has also competed in many logging shows running hot saws, chopping, and other events. Gary has since retired, but he still works occasionally. Those fortunate to have worked with him know how colorful he is -- always quick with a story and a smile.